Another TV Spot for Transformers: Bumblebee has landed with extended scenes from some of the previous trailers we saw. This new TV Spot is in English language (distributed by UIP Singapore) and we are yet to see the first TV Spot (which aired during MTV EMA Awards 2018) in English as well. Oh you meant that scene in the first trailer, my bad. Yeah it's different copter, I thought you were talking about the copter in the third trailer. That's not Starscream, it's Blitzwing. 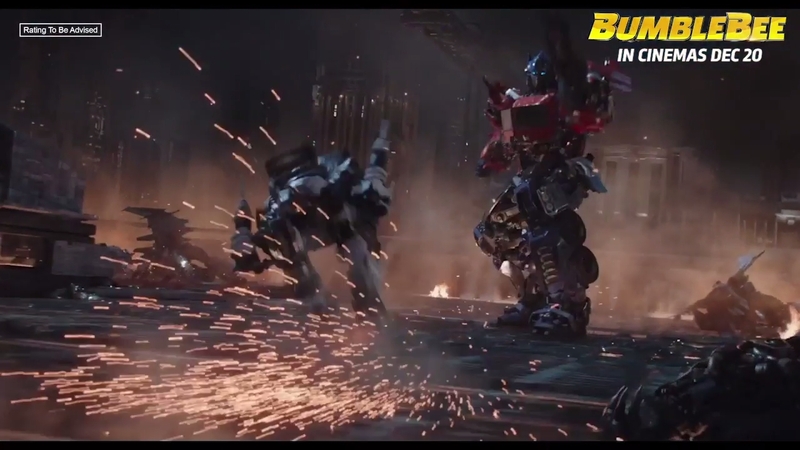 But we see what appears to be Starscream among a few other Seekers in the Cybertron scene in another trailer. I know that's what I was saying. The copter bee wraps the chain around pulling it to the ground and explodes is dropkick the cobra helicopter and the star symbol means U.S military all aircraft have that marking. The one he caught that was on fire before it hits the ground in another trailer is a huey helicopter, two different copters. When I’m the trailer did it show him enjoying hurting them? And what is the problem with killing an enemy in battle when 1. It is a WAR and 2. That enemy is evil? And it was nowhere near as violent as Optimus Prime’s constant slaughter of his enemies as well as his love for executing those who beg for mercy. He's the evil one so not really valid. well, you must have not seen other movies with bumblebee then.. he always likes it. If he was a good guy he wouldn't want to kill so that's wrong. I may never understand where people get the idea Bay Optimus loves killing? Their not the same. your example is a lot more black and white. Bumblebee is not a good guy, just evil. and enjoys hurting then acting like he's all "cute". Can you collaborate on that "Jesus"? This Luke Skywalker is disturbing, one scene has him wanting to be a monk, the next hurting Darth Vader……creepy. I think that "meteor" is actually Shatter's protoform, as it hits a Plymouth GTX . . . It was prob Bay that told them to add Drop Death in the trailer..
Dropkick and the one seen crashing into the ground and exploding is a version of the cobra attack helicopter. The one bee ketches is a huey utility troop or transport helicopter. It’s “catches”, by the way.